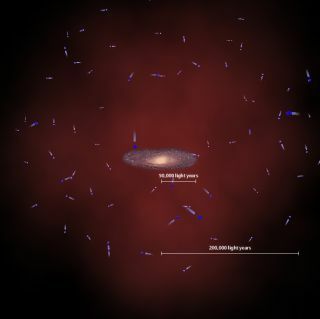 By measuring the speeds of distant stars, researchers estimated the mass of the Milky Way's dark matter halo (indicated in dim red), finding it to be much slimmer than previously thought. The MilkyWay galaxy weighs about 1 trillion times as much as our sun, according to a newestimate. Previousestimates had ranged from 750 billion solar masses to up to 2 trillion. Lately,researchers have been leaning toward the higher figure. But now astronomershave used a more refined method to conclude that our galaxy's mass is slightlyless than 1 trillion solar masses. Thegalaxy's mass is a mix of stars, gas, dust and mysteriousdark matter. The newestimate is based on a large sample of stars in the galactic halo, a relativelysparse sphere of stars that surrounds our galaxy's main disk. The speeds ofstars in the halo reveal the mass of the galaxy by allowing astrophysicists to inferthe amount of gravity required to keep those stars in orbit. "Thegalaxy is slimmer than we thought," said Xiangxiang Xue of the NationalAstronomical Observatories of China, who led the international team ofresearchers. "That means it has less dark matter than previously believed,but also that it was more efficient in converting its original supply ofhydrogen and helium into stars." Thefinding, based on data from the Sloan Digital Sky Survey (SDSS-II), has broadimplications for our understandingof the Milky Way, the researchers said in a statement. "Thetotal mass of the galaxy is hard to measure because we're stuck in the middleof it," explained collaborator Timothy Beers of Michigan State University. "But it is the single most fundamental number we have to know if we wantto understand how the Milky Way formed or compare it to distant galaxies thatwe see from the outside." Previousestimates had been based on 500 objects or fewer. The new math was based ondata for 2,400 stars. The largerdata set "gives us a huge statistical advantage," said study teammember Hans-Walter Rix of the Max Planck Institute for Astronomy (MPIA) inHeidelberg, Germany. Theresearch will be detailed later this year in the Astrophysical Journal.